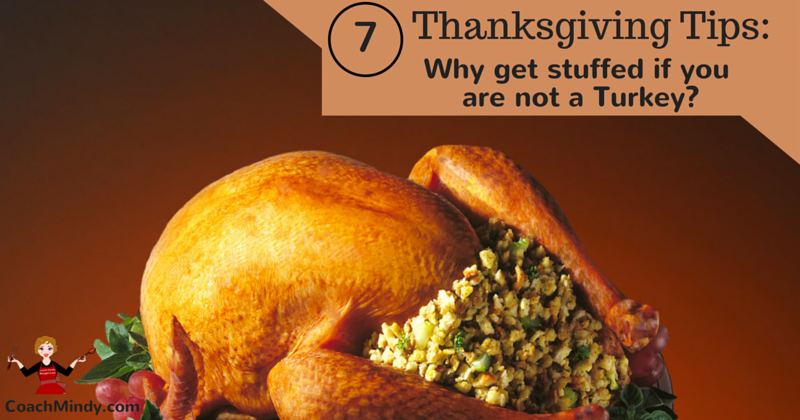 Why get stuffed if you are not a Turkey? 1. Eat during the day. Do not sit down to Thanksgiving dinner starving. Even consider pre-eating with salad, broth based soup, or vegetables. 2. Enjoy Thanksgiving dinner, but remember that your dinner is one meal of one day, not the start of four days of making poor food choices. 3. Enjoy your food. Know when you are full. Do not eat to eat. Eat slowly. 4. If you are a guest, bring a platter of roasted or cut up vegetables. Healthy food options are always welcome. If leftovers are offered to bring home, only take protein and vegetables. 5. Some feel our food enjoyment decreases after the first three bites. That is a wonderful reason to take small portions of the higher calorie foods. 6. If you are the host remember to have healthy food options. When the meal is over it’s important to get the fat laden dishes out of the house. Keep the protein and vegetables. 7. It is hard to lose weight at a holiday celebration. A better choice would be to reasonably enjoy your meal, maintain your weight, and get right back on your program at the very next meal. A free blog full of recipes, tips, & ideas! Visit Coach Mindy's profile on Pinterest. Difficulty losing weight? Check out the weight loss Mind Game! STRUGGLING TO STAY ON THE HEALTHY EATING PATH? Coach Mindy is fun, friendly, and a highly experienced Weight Loss Coach. Because she believes in the importance of continuing education, Coach Mindy regularly attends national and local conferences in the fields of weight loss, obesity, and coaching.